Fly over the south west of the Bungle Bungle to“Y” Gorge before soaring across the top of the enormous massif to the mouth of spectacular Piccaninny Gorge. Continue along the southern face, following Piccaninny Creek where you can view the mouth of Cathedral Gorge and soar amongst the famous orange and black striped sandstone beehive shaped domes. Our most popular flight includes the hidden red rock gorges of the northwest tip, Picaninny Gorge from end to end and the unique beehive formations that have contributed to the listing of the Purnululu National Park as a World Heritage listed area.This exciting flight shows off the famous striped domes, the deep caverns and gorges with palm trees clinging to cliff faces, the western wall and the meandering creek bed of Picaninny Creek. The first gorges we visit on this spectacular flight are; Deep Gorge and ‘The Twins’, 2 incredibly deep crevasses with Livistona palms clinging to the sides of the cliff faces. We then soar up to the highest point of the Bungle Bungle where you can see the entire massif stretching out below you. 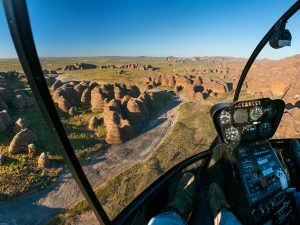 Then fly over the extraordinary Red Rock Gorges of the North West and towards the eastern side of the Bungle Bungle massif, to encounter incredible eroded sandstone formations and a maze of gorges. This area is not seen on any other scenic flight and is the fragile part of the national park which is not accessible to visitors at all on the ground. View Picaninny Gorge, Picaninny Creek, Cathedral Gorge and the famous orange and black striped beehive shaped domes. Fly over the Bungle Bungle on the Domes Special flight (A18) and land near the mouth of Piccaninny Gorge. This enormous gorge spreads into 5 fingers as it cuts through the Bungle Bungle Range. Your guide will lead the hike into the gorge and tell you about the area’s cultural significance to the Aboriginal people and its unique history, which led to the world heritage listing of Purnululu. The hike is up to 10km return and requires a high level of fitness and mobility. The rocky creek bed of Piccaninny Gorge is classed as a level 5 walk. Picnic lunch, morning/afternoon tea and cold water is included. Call us on 9168 7335 to book or contact us here. Not driving into Purnululu National Park? 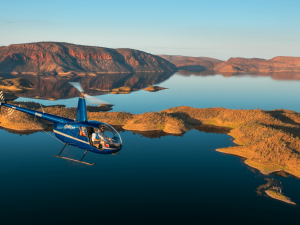 Check out our Bungle Bungle Helicopter Flights available from other locations in the Kimberley including Warmun, Lake Argyle and Kununurra. The sandstone massif of the Bungle Bungle Range is almost 99 times the area of Uluru.There are more stunning features and spectacular landforms to see on a HeliSpirit Bungle Bungle scenic flight than you would imagine possible. HeliSpirit is an Eco accredited Green Travel Leader. We monitor our emissions, our water use and generate our power from solar arrays.15 % of your tour price is given to the Department of Parks and Wildlife to put back into maintaining the Purnululu National Park. 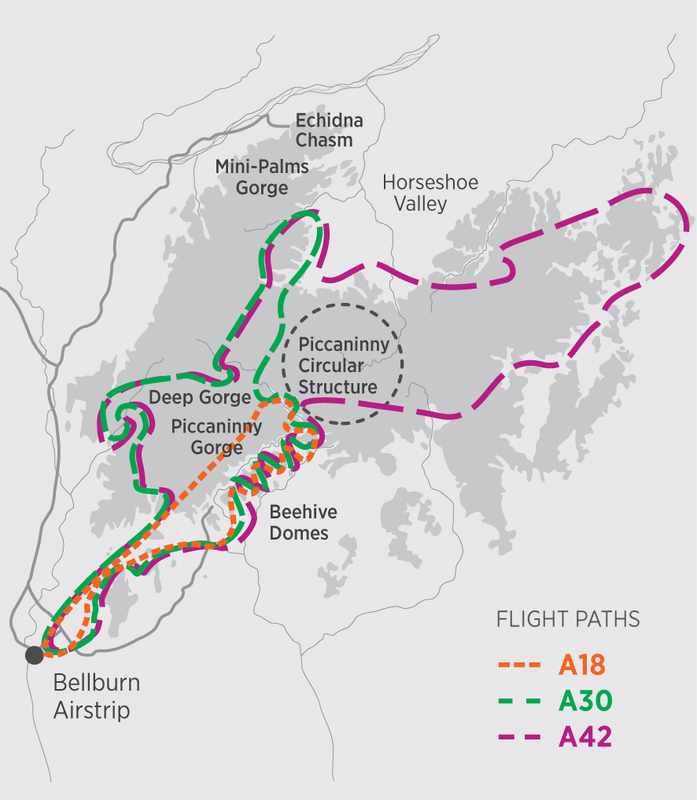 Our flight paths have been tailored in conjunction with the traditional owners of Purnululu and we do not fly over any culturally sensitive areas. Leave No Trace offers information to help you plan your trip in the Kimberley. Be prepared for your journey and help us look after our beautiful natural resources.